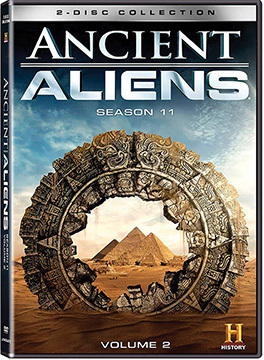 In Ancient Aliens: Season 11, Volume 2 ancient astronaut theorists explore incredible new developments in the search for evidence of extraterrestrial contact in our distant past—and even today. The nine episodes are: 1. Earth Station Egypt; 2. Island of the Giants; 3. The Taken; 4. The Sentinels; 5. Russia Declassified; 6. They Came from the Sky; 7. The Artificial Human; 8. The Alien Phenomenon; 9. Return to Mars. Includes interviews with David Hatcher Childress, Giorgio Tsoukalos, Erich von Daniken, Mike Bara, William Henry, Linda Moulton Howe, Hugh Newman, Brad Olsen, and many others. With Spanish subtitles for those who want it.